I purchased a tile magnet at a craft show I was in a couple years ago. It had a lovely image of vintage flowers somehow transfered onto it. Unfortunately, it fell off the refrig one too many times and now sits in a basket on my desk in about a million pieces (I can't bear to throw it out). I decided to start hunting for a tutorial on how to transfer images to basic bathroom tiles and couldn't really find anything that didn't require purchasing a type of chemical/adhesive help I did not already have. So I tried just using ModPodge and it was a fail. An epic fail. Half of the image transferred, and then peeled right off. So I thought I would try to ModPodge the printed images straight to the tiles. 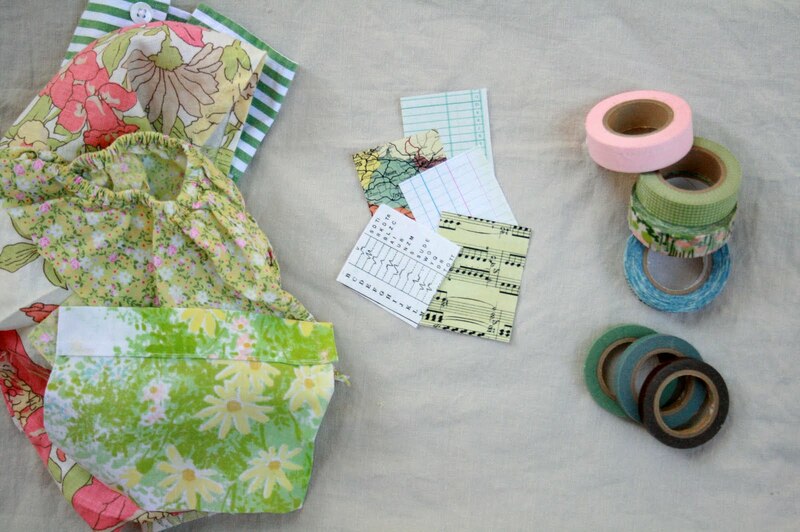 I decided to just go with it and start using different materials to see what would work and look best - I used the printed images from here, here and here, vintage sheets and clothing I found at a thrift store, and washi tape, and all three turned out great. I also found sheets of magnetic material at the thrift store (random, right?!). These little magnets are super cute, super inexpensive to make, and of course, super fun to make. 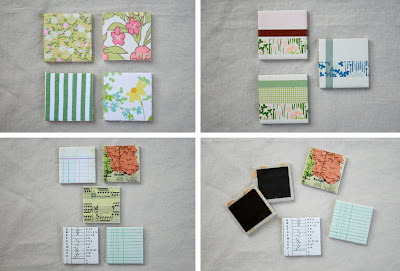 I purchased a sheet of 2"x2" tiles (they come in sheets of 36, glued together for about $3.25) from a home improvement store and then broke them apart at the glue (*edited: they come apart fairly easily by bending them back and forth at the glue) and trimmed off the excess glue with an x-acto knife. 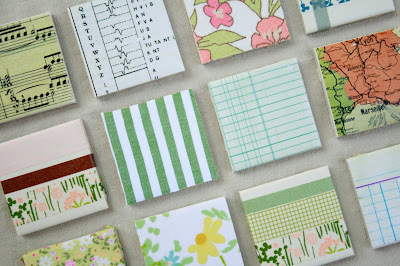 - Fave papers, cut down to 2"x2"
If you are using Washi tape, you can directly adhere it right onto the tile in a fun pattern, glue on a magnet and call it finished. If you are using paper or fabric: Using the foam brush, apply a thin layer of ModPodge over the top of the tile. Adhere the 2"x2" piece of paper or fabric and gently smooth out any air bubbles. 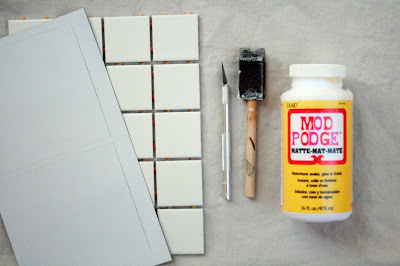 Apply another thin layer of ModPodge over the paper or fabric and around the edges of the tile to smooth out - this will ensure there are no edges of paper or fabric hanging off of the tile. Let dry completely. Love this and I will have to try it!! I pinned you on pinterest!! Our kids love to play with magnets. We have painted a wall with Cin magnet ink in their play room were they usualy play with magnet dolls, clothes and little magnet panels. 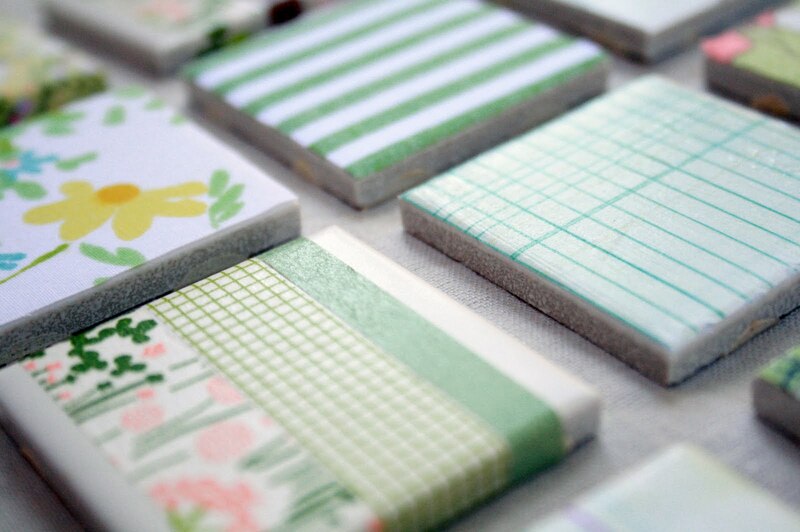 We will use your tip to make same tile magnets with them. I just had to "pin" this! I love this idea. 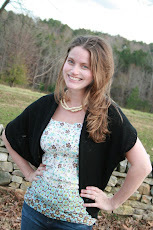 I see lots of learning opportunities for my girls and lots of gift ideas. This is great. I like the idea of printing letters- you could make a whole set of "alphabet tiles" to help a little one always see them on the refrigerator. Thanks for sharing this great project. I've used the same technique to make coasters but not magnets. Another project to add to my to-do list. Do you have any suggestions for breaking the tiles apart? I love this idea, so creative, thanks for sharing. Fabulous. I gotta get me some tiles! Love this, need to try! What magnets did you use? They don't look big and bulky like the ones I have. Are they pretty strong? Would this work using pictures? Thanks! I just tried making these, and they turned out great! I used some scrapbooking paper that had a watercolor look to it. Thank you for the straight-forward instructions and photos. 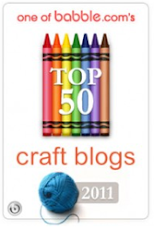 I'm not that creative or great with crafts, so this felt like quite an accomplishment! I'm going to check out the rest of your site for more inspiration. So cute! Where do you get your washi tape? Great idea. Def. going to attempt. :) It's always nice coming accros inexpensive projects my kids & I can do together. Thinking of usng to teach myittle one her sight words & shapes. With my oldest we have so many options. Thanks once again. This would be a project I plan to try out. I plan to make a dishwasher dirty dishes/clean dises magnet for my mother. It would be big enough for her to see the words!